BIOGAS Upgrading - this relatively new technology has been developed some years ago and has become a technology of which the level of interest has raised tremendously in the past few years. What is BIOGAS ? BIOGAS is a term, which refers to a type of gas that is generated naturally from the biological breakdown of organic material in fermenters without the presence of oxygen. The source of it is therefore purely natural from plants, wood, corn, sugar cane, etc. which are in most cases from farmes, who are disposing their waste into these centralised fermenters. The composition of BIOGAS is mainly methane, carbon dioxide and tiny amounts of hydrogen sulphide. 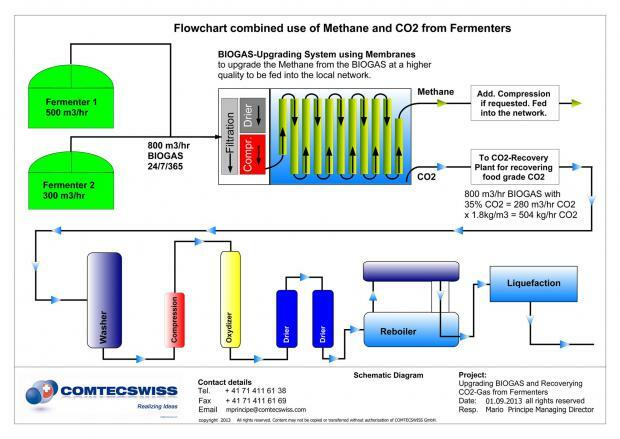 The BIOGAS composition is about 53% methane and 44% carbon dioxide (CO2). 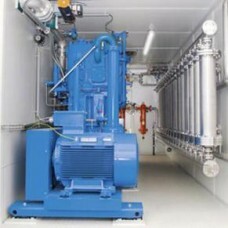 The process of upgrading is done by separating the CO2 and purifying the methane for futher use. Purified methane can be reinjected into the local gas grid network, filled in high pressure gas cylinders to operate busses, trucks, etc. or to generate electricity. In addition, the separated CO2 can be recovered as well and used for producing dry ice with its wide range of application.